We consider average-energy games, where the goal is to minimize the long-run average of the accumulated energy. While several results have been obtained on these games recently, decidability of average-energy games with a lower-bound constraint on the energy level (but no upper bound) remained open; in particular, so far there was no known upper bound on the memory that is required for winning strategies. By reducing average-energy games with lower-bounded energy to infinite-state mean-payoff games and analyzing the density of low-energy configurations, we show an almost tight doubly-exponential upper bound on the necessary memory, and prove that the winner of average-energy games with lower-bounded energy can be determined in doubly-exponential time. We also prove Open image in new window -hardness of this problem. Finally, we consider multi-dimensional extensions of all types of average-energy games: without bounds, with only a lower bound, and with both a lower and an upper bound on the energy. We show that the fully-bounded version is the only case to remain decidable in multiple dimensions. 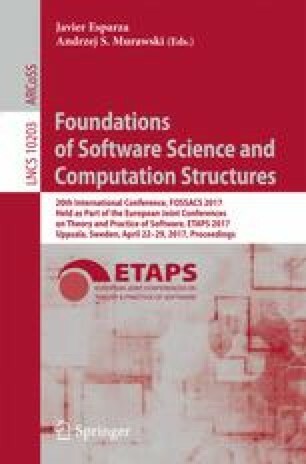 A full version of this paper  is available online: https://arxiv.org/abs/1610.07858. P. Bouyer and N. Markey—Supported by ERC project EQualIS (308087). M. Zimmermann—Supported by the DFG project TriCS (ZI 1516/1-1).